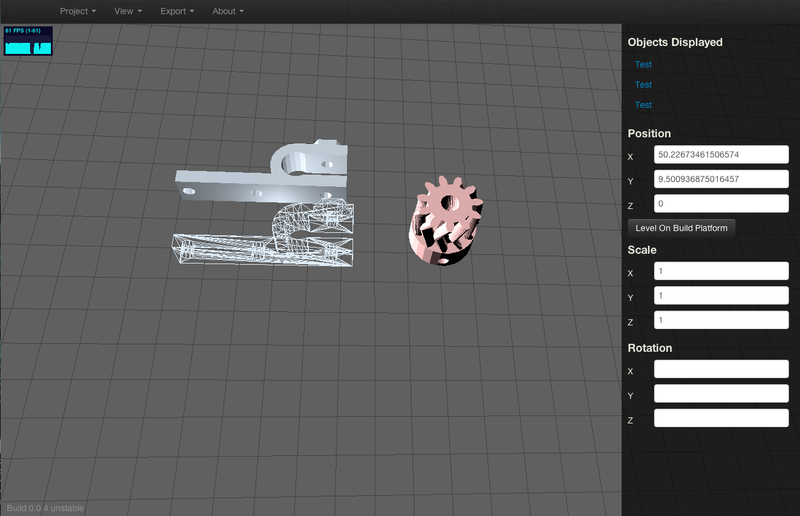 Fisher Innovation STLCAD is a web based HTML5 model preparation and slicing application for use when preparing 3D models for output on a 3D printer. The latest version of FI-STLCAD can always be found within the labs hosting environment. When usable builds are ready, they are posted to this environment, so bookmark the URL to view the latest release at any time. Feel like contributing to this project, making your own version, or just checking under the hood to see how things work, all of the project source code files can be found on the GitHub project page. If you have encountered an issue while using FI-STLCAD, feel free to document it within the project Issue Tracker. Although not all of these features are currently fully built in, the initial goal for this project is to create a universal web based replacement for the typical 3D Printer front end software solution. The intended feature set is as follows. Load STL from local source, web, or Thingiverse page. Converts STL data to JSON for quick loading. View STL as 3D model on build plate.